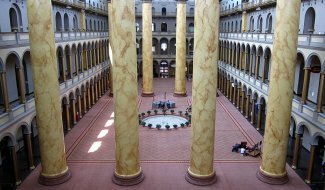 This summer, the National Building Museum brought back the popular Mini Golf exhibition. . During your visit to the beautiful National Building Museum, you have the opportunity to play a little mini golf. The exhibition included two 9-hole courses. The courses were created by leading architects in the Washington DC area and the courses were inspired by the architects “Vision of the Future”. The Mini Golf exhibition is fun for ages 4 and up.